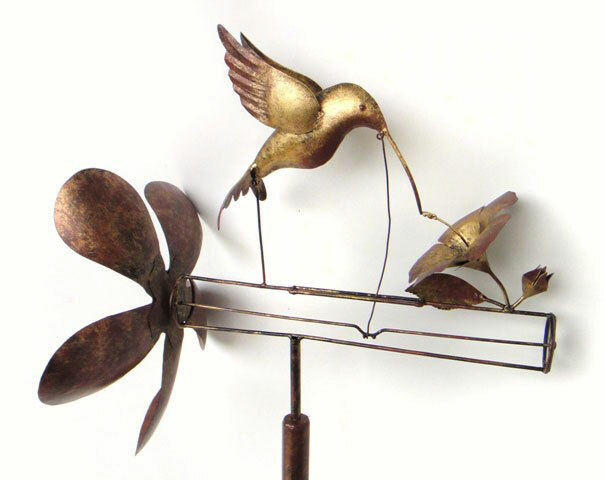 Classic Hummingbird Whirligig - Hummingbird bobs for nectar. A Classic Hummingbird Whirligig; As the prop turns in the wind, the hummingbird bobs for nectar from the flower. Hummingbird bobs for nectar as prop turns in wind. Propeller is shaped like a flower. Whirligig dimensions: 14 inches X 9 inches. Total dimensions with pole: 14 inches X 9 inches X 54 inches.